Purchased 1833 at the time of the Royal Academy of Arts (London) exhibition by Hugh Andrew Johnstone Munro [1795-1865], Novar, Ross and Cromarty, Scotland; (sale, Christie, Manson & Woods, London, 6 April 1878, no. 101); bought by (Thos. Agnew & Sons, London), for Kirkman Daniel Hodgson, Ashgrove, Kent; by descent to Robert Kirkman Hodgson, Gavelacre, Hampshire; sold 1893 to (Thos. Agnew & Sons, London); purchased the same year by Sir Charles Clow Tennant, 1st bt. [1823-1906], The Glen, near Innerleithen, Peeblesshire, Scotland; by descent to his grandson, Christopher Grey Tennant, 2nd baron Glenconner [1899-1983], The Glen; sold July 1923 to (Charles Carstairs for M. Knoedler & Co., London), from whose New York branch it was purchased November 1923 by Andrew W. Mellon, Pittsburgh and Washington, D.C.; gift by 1937 to his daughter, Ailsa Mellon Bruce [1901-1969], New York; bequest 1970 to NGA. The painting was number 8 in the catalogue of the exhibition. On the Tennant family see James Dugdale, "Sir Charles Tennant, the Story of a Victorian Collector," The Connoisseur, 178 (September 1971): 11. Royal Academy of Arts, London, 1833, no. 8. Works by the Old Masters, and by Deceased Masters of the British School. Winter Exhibition, Royal Academy of Arts, London, 1894, no. 103. Works by British Artists Deceased Since 1850. Winter Exhibition, Royal Academy of Arts, London, 1901, no. 82. Ten Paintings from the Tennant-Glenconner Collection, M. Knoedler & Co., Inc., New York, 1924, no. 9. 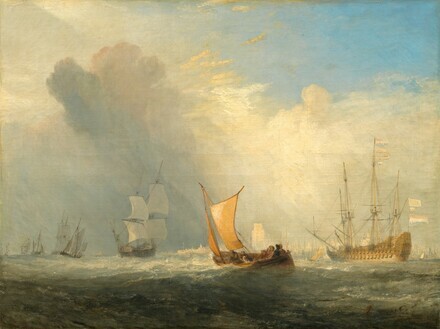 Turner: The Late Seascapes, Sterling and Francine Clark Art Institute, Williamstown; Manchester Art Gallery; The Burrell Collection, Glasgow, 2003-2004, unnumbered catalogue, fig. 20, repro. (shown only in Williamstown). J.M.W. Turner, National Gallery of Art, Washington, D.C.; Dallas Museum of Art; The Metropolitan Museum of Art, New York, 2007-2008, no. 114, repro. The medium-weight canvas is finely plain woven; it has been lined. The ground is light gray (warm in tone on account of brown admixtures), and is smoothly applied. There is thin dark gray brushed underdrawing in the two ships to the left of the ferryboat. The painting is executed in thick opaque layers with moderate impasto. The impasto has been flattened during lining. There is scattered retouching throughout the sky and along all the edges of the painting. The natural resin varnish has discolored yellow to a moderate degree. Arnold's Magazine of the Fine Arts, n.s., 1 (June 1833): 187. Athenaeum 289 (11 May 1833): 297. London Literary Gazette, no. 851, 11 May 1833: 299. The Times (London), 1 July 1833. Thornbury, Walter. The Life of J.M.W. Turner, R.A.. 2 vols. London, 1862: 2:400 (2d ed., 1877). Frost, William. Revised by Henry Reeve. A Catalogue of the Paintings ... in the Collection of the late Hugh Andrew Johnstone Munro, ... 6 Hamilton Place, London; with some additional paintings at Novar. London, 1865: no. 40. Redford, George. Art Sales. 2 vols. London, 1888, 1:270, 272. Cunningham, C.C. "Turner's Van Tromp Paintings." The Art Quarterly 15 (1952): 325-329. Dugdale, James. "Sir Charles Tennant: The Story of a Victorian Collector." The Connoisseur 178 (1971): 8, 12, repro. Bachrach, A.G.H. Turner and Rotterdam 1817-1825-1841. Deventer, n.d. : 20, repro. 21. European Paintings: An Illustrated Summary Catalogue. National Gallery of Art, Washington, 1975: 356, repro., as Van Tromp's Shallop. Walker, John. National Gallery of Art, Washington. New York, 1975: no. 602. color repro. Bachrach, A.G.H. "Turner, Ruisdael and the Dutch." Turner Studies 1 (1981): 26, pl. 13. Butlin, Martin, and Evelyn Joll. The Paintings of J.M.W. Turner. 2 vols. New Haven and London, 1977. (2d. rev. ed., 1984): 1:no. 348; 2:pl. 351. Walker, John. National Gallery of Art, Washington. Rev. ed. New York, 1984: 413, no. 587, color repro., as Van Tromp's Shallop. European Paintings: An Illustrated Catalogue. National Gallery of Art, Washington, 1985: 407, repro. Hayes, John. British Paintings of the Sixteenth through Nineteenth Centuries. The Collections of the National Gallery of Art Systematic Catalogue. Washington, D.C., 1992: 272-274, repro. 273.